Ochronosis can be defined as a syndrome that occurs when homogentisic acid accumulates in the connective tissues. The condition was first brought into notice by Rudolf Virchow back in 1865. It gets its name from the yellowish discoloration of tissues detected under the microscope. Macroscopically, the tissues that are affected tend to be bluish grey in color due to a light-scattering phenomenon that is termed as Tyndall effect. Ochronosis is most frequently associated with Alkaptonuria. However, it can also take place from the exogenous administration of various phenol complexes such as Hydroquinone. Ochronosis has been noted worldwide and the highest frequency has been sighted at the Dominican Republic and Slovakia. In these countries, the prevalence of this ailment is around 1 in every 19000 inhabitants. Internationally, it affects around 1 in every 250,000 to 1000000 individuals. 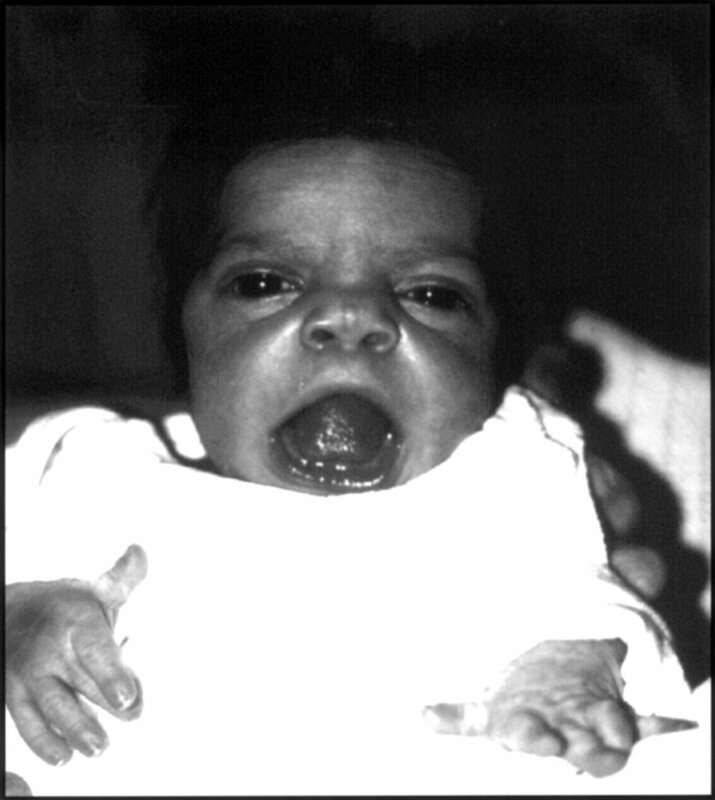 This is a type of autosomal recessive disorder that occurs due to an absence of homogenistic oxidase enzyme. This form of the condition can be described as an avoidable dermatitis that can occur due to the topical application of chemical compounds such as phenols and hydroquinone. It was first observed in 1912 by Plumtre and Beddard when a certain patient who applied phenol on his leg ulcer was detected with this syndrome. Exogenous Ochronosis induced by hydroquinone was first described by Findlay in the year 1975 when he studied patients applying skin lightning anointments that contained this compound. The causes of this disorder depend on the type that an individual suffers from. 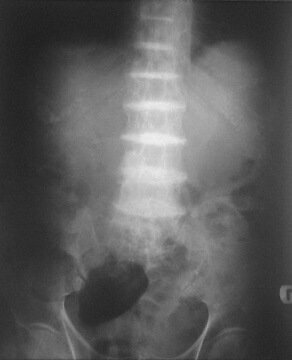 Endogenous Ochronosis occurs due to low amounts of homogentisic acid oxidase. Alternatively, changes in the skin and cartilage can be brought about by administration of quinacrine. Topical applications of carbolic acid to the cutaneous ulcers lead to ochronotic skin alterations as well. Exogenous Ochronosis is generally caused from a prolonged use of certain kinds of skin lightening lotions and creams, even though the proportion of hydroquinone present is as low as 2%. Skin lightening products can be found widely throughout the world. This could be owing to the social and aesthetic factors or personal preferences in parts of the world where a fairer or lighter skin complexion is taken as a sign of beauty or is simply considered favorable. In addition to that, skin lightening products having hydroquinone are generally used to treat hyperpigmentation problems like melasma. Prolonged use of lotions and products having this compound might result in exogenous ochronotic lesions. With approximately 10 to 15 million skin whitening products that are sold annually the dangers of this abnormality is at a rise. Ochronosis takes place due to the deposition of phenols like hydroquinone and homogentisic acid as plaques on matrix of cartilage. Pigments of these substances can also get incorporated into the elastin and collagen fibers. This makes the pigment in the skin change the structure of fibers thereby resulting in curling and enlargement. They gradually start resembling the fibers that are seen in solar elastosis biopsies. Furthermore, the embedded pigments create cross-linkages with the pigment dispositions in the adjacent fibers that reduce and stabilize the elastic recoiling of these fibers. Due to this reason, the elastic structure hardens which increases its brittleness and rigidity. The moment it gets ruptured, the exposed pigments lead to a foreign body reaction followed by inflammations. Deposition of this pigment also leads to the deposition of hydroxyapatite, a mineral which is responsible for the process of bone calcification which further hardens the connective tissue. This pigment can further be excreted by the glandular cells in the apocrine, ceruminous sweat glands along with the prostate and breast tissues. This leads to a dark pigmented breast milk and sweat. The pigment excretion is only spotted in endogenous Ochronosis and does not take place from the topical phenols. The pigment gets deposited all throughout the skin. However, it becomes apparent only in certain specific areas where its concentration is significant enough to be observed clinically. This generally occurs in places where the connective tissues are thick, such as the joints and tympanic membrane or closer to the skin surface, such as hypothenar and thenar eminences along with the sides of fingers. 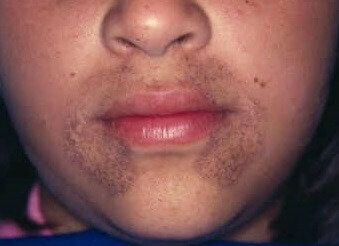 In case of exogenous ochronosis, hyperpigmentation is localized in places where an inciting agent or cream has been applied. Intradermal nevi have an appearance like blue nevi. The most noticeable change that can be observed around the eyes is the darkening around palpebral fissure. Hyperpigmentation of the cornea is possible if the eyes are exposed to the phenol vapors. Hardening and darkening of the ear cartilage is a common feature of this condition. There is also a frequent involvement of the nasal cartilage. Hardening of laryngeal cartilage can also affect a patient’s voice. Stiffening of ribs along with reduced lung functioning has been reported as well. Intravertebral cartilage is more susceptible to herniation. Hardening of ligaments and tendons can render them vulnerable to rupture. Change of color in joints can be clinically observed. Arthropathy often takes place owing to microruptures and chronic inflammations. Stenosis might result from increased rigidity of connective tissues and chronic inflammation. There are numerous health conditions whose symptoms overlap with those of Ochronosis. Hence, while determining the diagnosis of this disorder, it is necessary to differentiate it from such similar conditions in order to come up with the best treatment plan. Though there are no medical treatments for this disease at present, the genetic advances do provide a certain hope that preventive measures are in the pipeline. Some medical experts have suggested a diet that is low in phenylalanine and tyrosine that in turn brings down the toxic by-product homogentisic acid. Alternatively, a diet that is rich in Vitamin C prevents homogentisic acid oxidation. Another probable remedy is nitisinone. The US Food and Drug Administration (FDA) have sanctioned this particular drug for treating Tyrosinemia type 1. It dramatically brings down the urinary excretion of homogentisic acid simply by inhibiting 4-hydrophenylpyruvate dioxygenase. In addition to that, it also minimizes the accumulation of HGA. Ochronotic arthropathy is mostly treated using analgesia, physiotherapy, along with rest and a prosthetic joint replacement as and when needed. A Q-switched alexandrite laser can be used to cure hydroquinone-induced exogenous ochronosis. Upon being diagnosed with this disorder, patients should immediately stop using creams and lotions that contain this chemical substance. Doctors should also be informed of any previously used skin lightening products that may have hydroquinone as one of the ingredients. Sufferers of this disorder can expect a healthy life span once they are given proper medical attention. The following images show the appearance of individuals who are affected by this disorder. My nephew is suffering from Ochronosis . Is there any treatment for the disease. he has been seen by orthopaedicians in India. But no relef in the back pain, what are the other complications that may arise due to this disease.